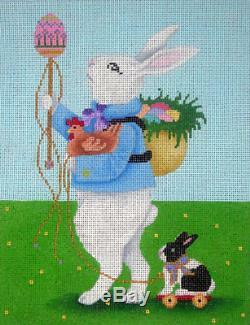 HANDPAINTED NEEDLEPOINT CANVAS BRENDA STOFFT EASTER BUNNY! The size is 6.5 x 9 inches. Full color design is easy to see while you stitch! We add more weekly, so make sure to. We take pride in offering items that will make you say, WOW! The item "Needlepoint Handpainted Brenda Stofft EASTER BUNNY 7x9" is in sale since Saturday, March 2, 2019. This item is in the category "Crafts\Needlecrafts & Yarn\Embroidery & Cross Stitch\Hand Embroidery Cloth & Canvas\Plastic Canvas".